Can you imagine having permanent, beautifully shaped eyebrows? Eyebrows are the most defining feature of your face. They emphasise your eyes, accentuate your expressions and give symmetry to your beauty. Permanent make-up will allow you to throw away those pencils – no more smudging, or reapplying throughout the day! 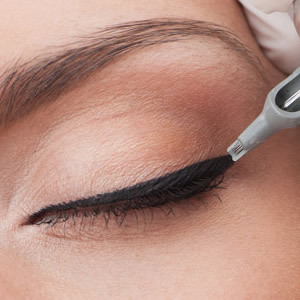 Smudges, smearing and repeatedly reapplying your eyeliner are now a thing of the past with permanent make-up. If you suffer with poor eyesight, watery eyes, sensitivity to eye cosmetics or you simply have a busy lifestyle, look no further! Say goodbye to your daily eyeliner routine and wake up in the morning looking your best with stunning, alluring eyes! Looking your best every day takes a lot of time and effort; nobody gets out of bed looking like they’ve just been made up by a professional makeup artist. Many of us find it difficult to maintain our desired look and appearance day in and day out, because we simply don’t have the time with our busy life styles. At my beauty clinic located in Milton Keynes, I offer men and women alike cosmetic solutions to make looking good any time of the day easy! Let me help you achieve the glammed up and confident look you want with my comprehensive cosmetic permanent beauty services. Permanent make-up or cosmetic tattooing allows you to improve, correct and enhance your natural features. Whether it’s providing more definition to your eyes with permanent eyeliner, creating beautiful uniform microblading eyebrows or powdered eyebrows, or by bringing symmetry, fullness and colour to your lips with lip liner tattoo, permanent make-up offers long lasting and effortlessly realistic results. What does permanent makeup involve? The non-surgical process involves inserting hypo-allergenic pigments into the skin to deliver a permanent makeup effect by creating natural looking hair stroke eyebrows. And although the intensity of colour is darker immediately after the procedure, it will reduce and soften during the healing process to deliver a subtle and natural looking finish. Some people experience some discomfort during the procedure, whereas others do not. That’s why I apply a numbing agent to the area being treated to aid your comfort during the treatment. Permanent makeup can last from between one to three years with only an annual touch up required to maintain the shape and colour of the pigment. Therefore it’s a great solution if you’re looking to correct or enhance your features without being a slave to the daily make up routine. If you’re interested in the treatment process and procedures, then why not take a look at this short video. View the client consultation, watch the preparation and see first hand how your permanent make-up will be applied.